D M R Sekhar is a friend that I acquired at a blog site. He has now published a collection of his poems under the title Temples of Sand. I was privileged to write its Foreword. I am reproducing that foreword below since I think it makes a few valid points about poetry. The world has become so prosaic today that poetry has almost vanished from its literature. If poetry still survives, it does so in some unexpected and rather pragmatic domains such as architecture and horticulture. There are some buildings, flyover conglomerates or parks which embody the human quest for the poetic. They are rare too. Utilitarianism has become such a dominant guiding principle in every sphere of human activity today that there is little place left for beauty to find expression. Poetry cannot be born without some yearning for the beautiful. When science started dominating the human civilisation, beauty took a backseat. Science brought new and newer technologies which made life better and more comfortable for the human species. When the German philosopher, Hegel, said that the rhythm of poetry serves to lift us into a world quite different from that of prose or everyday life, he was obliquely referring to the beauty that is inevitably embodied in poetry. The European movement known as Enlightenment was a genuine attempt to release mankind from the dark forces in the mind which led people to superstitions and subhuman activities. Enlightenment focused on the noble human quality of reason. Eventually science and technology reaped rich harvests by putting human rational faculty to good use. Today, in the first quarter of the 21st century, we stand inundated with technology. Many of the blessings of that technology are also a curse. Dealing with redundancy is perhaps the biggest curse. A product like a mobile phone or a car or a computer becomes outdated even before we have learnt to use all of its features. The product is replaced with a newer version. Too many old versions become redundant too soon. The redundancy has affected human relationships too. Utilitarianism has almost become the sole criterion of relationships. Science cannot be blamed for this sad situation. Socio-economic policies are not made by science. The neo-liberal policies that drive the global affairs today evolved out of a complex network of forces. Competition and acquisition have become the major driving forces of today’s global system. Both these– competitiveness and acquisitiveness – are essentially isolating forces. They isolate one man from another. They motivate each person to see the other as either a rival to be defeated or a tool to be used for one’s own benefit. While science and technology offered a more comfortable, or at least a less laborious, life, neo-liberalism held out the promise of an affluent life with increased wealth-creation. Both comfort and wealth are positive factors. Yet, after three centuries of technological revolution and three decades of economic revolution, the world has not become any better place than earlier for most people. On the contrary, some beautiful things like poetry nearly vanished from the world. The decampment of poetry is just a symptom of a deeper malaise that is afflicting the human civilisation today. The real malaise that has gripped civilisation today is man’s alienation from the deeper cores of his being. Erich Fromm distinguished between two basic orientations toward life: having and being. A having orientation reflects a person’s competitive concern with possessing and consuming resources. This orientation is fostered by technological societies, he argued. The being mode, in contrast, focuses on what one is. It focuses on sharing rather than competition. Today’s world does not encourage the being mode. When we are constantly competing to appear better than the other, we cannot be our real selves. We are forced to put on masks. Masks do not have feelings and emotions except those which are painted on them. Masks cannot have poetry in their being. We have reached the “profound unhappiness” of masks. Travelling inward, into the deepest cores of our hearts, is the solution. Being in deeper touch with our emotions and the poetry that is throbbing in those emotions is one remedy to the ills that plague contemporary civilisation. Some of the most profound truths lie in poetry. Reason and science deal with the material world, with things as they are in themselves. To that extent, they bring us ‘objective’ truths. But man does not live by objective truths alone. In fact, quite many of his truths are subjective. Human beings are concerned not only with understanding things as they are in themselves, but also with the impact of those things on their emotions. On the one hand, as W H Hudson said, “When science has provided us with its completest rationale of things, we are still primarily impressed by their mystery and beauty.” On the other hand, there are many recesses in the human mind which are not satisfied by purely rational answers. Otherwise, evil would not have found a place in the human world. “Poetry begins where matter of fact or of science ceases to be merely such, and to exhibit a further truth…” said Leigh Hunt. While truth in science is fidelity to facts, in poetry it is “fidelity to our emotional apprehension of facts, to the impression which they make upon us, to the feelings of pleasure or pain, hope or fear, wonder or religious reverence, which they arouse” (W H Hudson). That is why poetry is more relevant today than ever. We need poetry to take us back to our heart and its profound yearnings. 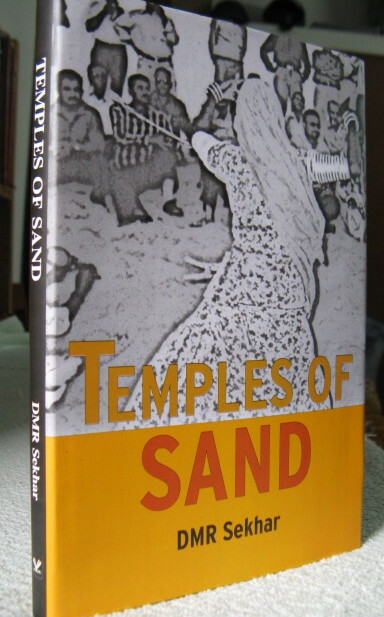 D M R Sekhar’s present collection, Temples of Sand, consists of poems that aspire to take us back to our hearts. Most of the poems in this collection are brief and to the point. They do not seek to make a point, however. Like all good poems, they seize the reader’s imagination and work on it slowly. They let the reader’s imagination do the rest of the work. Poems like ‘Sun, you and me,’ ‘Mad’ and the title poem ‘Temples of Sand’ are just a few examples. Most of the poems contain the fundamental truths of life which a poet brings to the reader through the unique prism of his imagination. For example, ‘Raging Fire,’ or ‘Alive’. Arresting metaphors are the greatest wealth in a poem. Poems like ‘An old dream,’ ‘The Tigress’ and ‘Night Queen’ reveal the poet’s exquisite skill in producing such metaphors. While there is much Romantic longing in many of the poems, many contemporary evils are dealt with much sensitivity. Occasionally the whole history from Kurukshetra to the Vietnam War gets telescoped in a few lines (‘Skull dance’), or the poet merges into the cosmic dance riding the wave of just six lines (Tandavam). A few of the poems are marked by remarkable wit and drama too: ‘Mr Right’ and ‘The Wisest,’ for example. There are many poems in which the poet implies the insignificance of his own being as a poet. Most of the poems eloquently, though subtly sometimes, bring out the essential ironies and paradoxes of life, which scientific truths and economic approaches will not be able to perceive. That is why these poems will strike a chord in the reader’s heart. This entry was posted in Literature and tagged poetry, truth. Bookmark the permalink.